Hi everyone, Nicky here calling in from Kitchen Sanctuary with a cake that’s perfect for a relaxing Sunday afternoon. Rhubarb is one of my favorite desserts – in cobblers, streusels, jellies and of course cake! Today I’m combining cake and streusel for a cake that’s tender, with a topping that’s sweet and crunchy! Rhubarb can be quite difficult to work with when it comes to cakes. If releases a lot of moisture, which can be great, so long as you don’t add too much. It’s also quite a heavy fruit, which means it can sometimes sink to the bottom – especially if the pieces are too big. The rhubarb is left in a bowl with some sugar – which sweetens the fruit, but also releases a little of the moisture. Just before it goes into the cake, it’s dredged in flour. The flour sticks – as the rhubarb is moist. The flour then helps it ‘cling’ to the cake mixture. The cake batter is quite thick, so the rhubarb is more likely to stay where it is. The rhubarb is added in two layers to the cake – rather than being mixed with the cake batter. Half the cake batter is spread on first, followed by half the rhubarb – so already we can ensure there’s no rhubarb right at the bottom of the pan. The rest of the cake batter is then added, then remaining rhubarb is placed on top. The crumble goes over the rhubarb layer to protect it from the heat of the oven. I love serving this cake after a roast dinner on a Sunday afternoon. Serve it with cream, ice cream or custard (or maybe all three!!). What are your favorite rhubarb desserts? 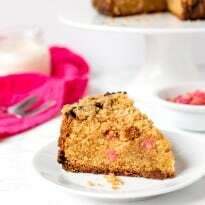 A moist and tender cake, dotted with pocket of sharp rhubarb and topped with a brown sugar streusel. Preheat the oven to 350F. Line the base and sides of a 20cm loose bottomed cake tin with baking parchment and put to one side. Place the chopped rhubarb in a bowl and top with 2 tbsp of the granulated sugar. Stir and put to one side. Next make the crumble topping. Place the flour, baking powder and cold butter in a bowl and rub the flour into the butter with your fingertips until you have rough breadcrumbs. Stir in the sugar and put to one side. Next make the cake. Place the granulated sugar and butter into a large bowl. Using a mixer or a hand whisk, beat the butter and sugar together until pale and creamy. Stir in the eggs, vanilla extract and soured cream. Then gently fold in all but 2 tbsp of the flour, the baking powder and the salt. Spoon out half of this mixture into the cake tin, and smooth using the back of a spoon. Ensure all of the base is covered. Sprinkle the 2 tbsp of flour onto the rhubarb, and scatter half of the rhubarb onto the cake mix in the tin. Spoon the rest of the cake mix on top, then scatter on the remaining rhubarb. Sprinkle all of the crumble topping on. Make sure it goes right up to the sides, otherwise the cake mixture will try to rise up the sides of the tin and on top of the crumble topping. Place in the oven for 75-90 minutes – until an inserted skewer comes out clean. It’s worth covering the cake with some tinfoil after about 50-60 minutes to prevent the top from burning. Once cooked, take out of the oven and leave to cool in the tin for at least 20 minutes. Then remove from the tin and leave to cool further on a cooling rack. Serve with fresh cream. This cake will stay fresh for 2-3 days, wrapped and stored in an air tight container at room temperature. This totally takes me back……mom used to bake with rhubarb very often. She made the best cakes and breads! Might have to relive a moment or two with this recipe! I usually just make a rhubarb crisp dessert but this looks so good. This reminds me of my childhood. Rhubarb + crumble cake, count me in! I gotta make this cake as it looks delicious! This looks like an awesome crumble cake. We all adore rhubarb! Thanks for the recipe, can’t wait to make this! 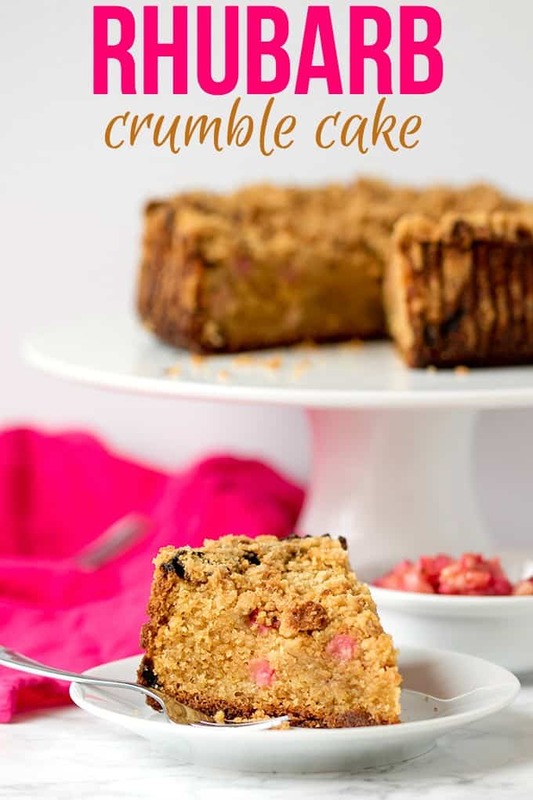 I love rhubarb and I love crumble, so this cake looks and sounds delicious, I’m going to have to make it up!! Looks delicious! I like the idea of serving it with “cream, ice cream or custard (or maybe all three!! )” to make it even more delicious. This looks really good another great recipe for rhubarb, thanks! This looks lovely! I have never had Rhubarb before, knowingly. I love crumb cakes though! I will have to give this a try. Hopefully I like it! Thank you for sharing the recipe. I used to eat Rhubarb all the time as a child and now I never see it or a recipe anywhere.People seem to have forgotten about it.I will try this.Looks wonderful. 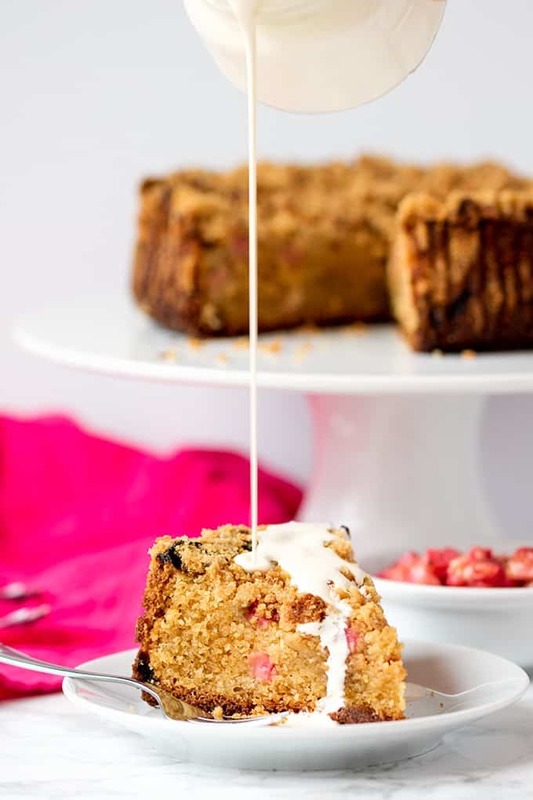 I’ve never made anything with rhubarb before, but this looks so yummy, I’ll have to give it a try! This sounds very delicious! I’ve never tried this kind of cake. I am not a rhubarb fan but my hubby is so he would love this cake, thanks for the recipe! 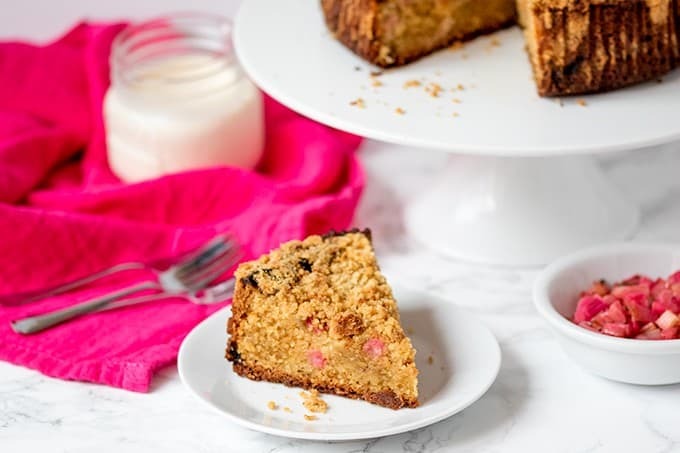 This rhubarb crumble cake is a rare recipe to find.Here’s another recipe jewel for my recipe file.I am going to love it!Thank you. I cannot wait for the first of the rhubarb from my grandmother’s garden! Rhubarb will be up soon, can I can’t wait to try this. I am always looking for new Rhubarb recipes. We have wild rubarb growing in our backyard. looks delicious. Rhubarb is just starting to come in. This looks like a great way to serve rhubarb and balance the acidity! This looks pretty and sounds so tasty! This looks amazing – we have many Amish families that grow and sell rhubarb waaaaay cheaper than the grocery store, so I stock up! Thanks for sharing this at the Lou Lou Girls Fabulous Party! I want to enjoy ALL the rhubarb while it’s still in season – and this looks like the perfect way to celebrate! This looks so yummy. I love Rhubarb, but have not put it in a crumb cake. I will now. 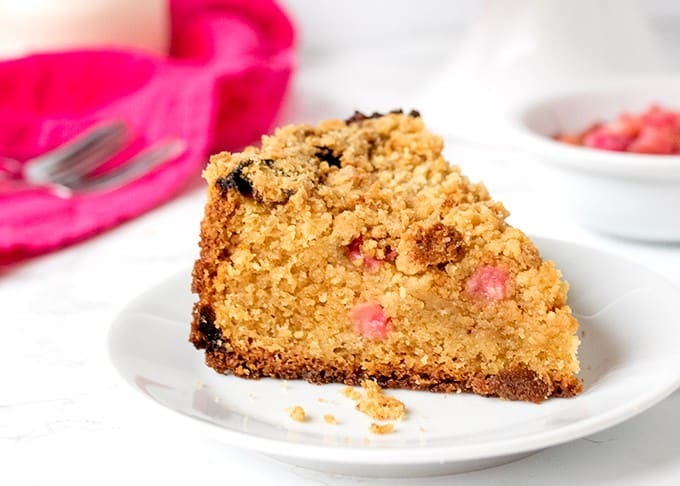 Your Rhubarb Crumble Cake looks fabulous! Thanks so much for sharing with Full Plate Thursday and have a great day!